Wind Speed & Direction (Ultrasonic Anemometer 2D). where T is the temperature of the air in degrees Celsius. The Ultrasonic Anemometer 2D is designed to detect the horizontal components of wind velocity and wind direction as well as the virtual temperature in two dimensions. The Ultrasonic Anemometer 2D consists of 4 bi-directional ultrasonic transducers, in pairs of 2 which are opposite each other at a distance of 250 mm. 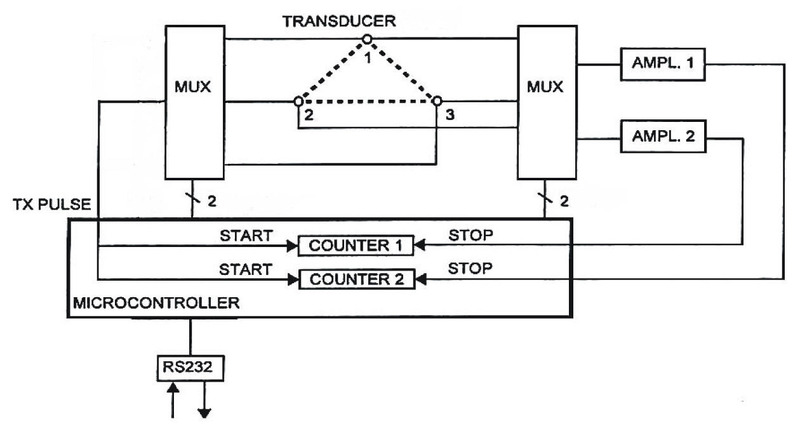 The transducers act both as acoustic transmitters and acoustic receivers. The respective measurement paths and their measurement direction are selected via electronic control. When a measurement starts, a sequence of 4 individual measurements in all 4 directions of the measurement paths is carried out at maximum speed. The measurement directions (acoustic propagation directions) rotate clockwise, south to north, west to east, north to south and east to west. When the sound wave travels against the wind, the total transit time is increased by a wind speed dependent amount. When the sound wave travels with the wind, the total transit time is reduced. 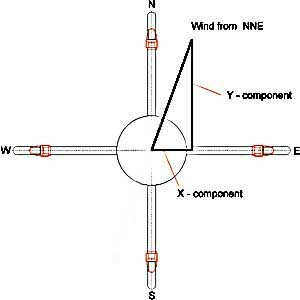 The different wind speeds and directions are measured over a fixed path. As the speed of sound is very dependent on the air temperature, the propagation time of the sound is measured on both of the measurement paths in both directions. In this way, the influence of the temperature dependent speed of sound on the measurement result can be eliminated by subtracting the reciprocals of the measured propagation times. By combining the two measuring paths which are at right angles to each other, one obtains the measurement results of the angle and velocity of the wind. d is the distance between the transducers (0.25m). v is the wind speed along the transducer axis. These formula's assures that the wind speed does not depend on pressure, temperature and humidity. As previously mentioned, the speed of the propagation of sound is highly dependent on the air temperature, but is hardly affected by air pressure and humidity. As this is a measurement of gas temperature which is made without thermal coupling to a measurement sensor, it is called the "virtual temperature". 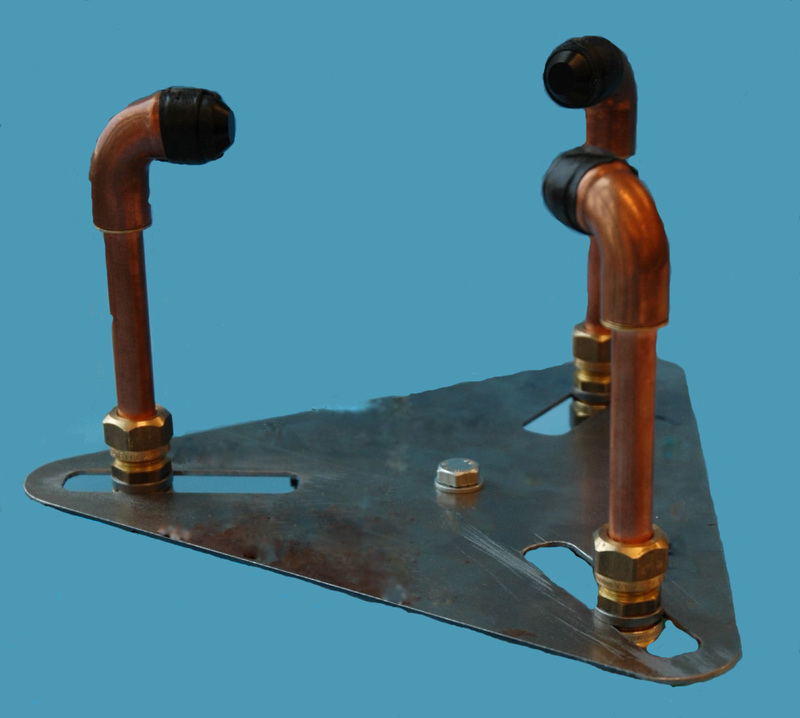 The advantages of this measured variable is the avoidance of measurement errors such as those which occur when a solid state temperature sensor is heated up by sun irradiation or cooled by evaporation cooling by rain and wind. A number of zero crossing samples will need to be taken to see if they are valid or noise. After each zero crossing, the amplitude increases for a number of cycles, before decaying away on the received signal. Using a fast ADC (analog to digital converter - e.g. dsPIC30F series), this received digitized signal is processed for a number of samples after each zero crossing, looking for this characteristic increase in amplitude and not the decrease in amplitude from a ringing (oscillating) transducer after the transmit pulse (crosstalk) or structure borne ultrasound. The final received signal is a mixture of body signal (decaying), ringing from previous received or transmitted signal (decaying) and received air signal (increasing then decaying). This will cause the proceivied start of the received air signal to appear stretched, shrunk or in phase, so the zero crossing point will continually change at this point causing jitter and not a fixed measurement. The received signal (measure a number of timing of zero crossings and amplitudes) is passed through a mismatched filter (compares received signal to template of reference signal increasing in amplitude) and extract the wanted air signal to win back the actual starting point. A mismatch filter is achieved using the weighting filter with the application of adaptive weighting coefficients for side lobe suppression in cascade behide a matched filter. Dug this up (If the template (reference signal) for the convolution isn't exactly a replica then the filter might be said to be "not matched" or "mismatched"). True or false ? 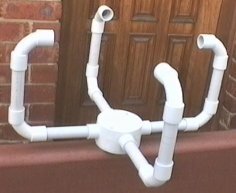 Project is on hold at present - what looks good on paper does not all ways work in practice. Due to a lot of factors altering the final outcome. Will get back to it in near future with fresh ideas, new circuit and brushed up on complex mathematics for digital signal processing (DSP). The following ultrasonic sensors work. MA40E8-2 (14mm Dia), Willow Technologies (US$16.95 each + US$20.00 shipping). The following ultrasonic sensors have not been tested for suitability (use at your own risk). MA40E6-7 (18mm Dia), Willow Technologies. MA40MC10-1B (10mm Dia) or MA40E6-7 (18mm Dia), Murata. T/R40-12H (12mm Dia), T/R40-14A (14mm Dia), T/R40-18D (18mm Dia), Audiowell Electronics (Guangzhou) Co.,Ltd. BPU-1640IFAH10.5S (16mm Dia), BPU-1840IFAH12 (18mm Dia), BPU-1840IFAH14S (18mm Dia), Bestar Electronics Industry Co Ltd.
40CA-18SC (18mm Dia), APC International Ltd.
40CA-15E (15mm Dia) or 40CA-18E (18mm Dia) or 40CA-18SC (18mm Dia), Ceramic Transducer Design Co.,Ltd. HE240STR (27mm Dia - 3/4" NPT - US$79.00 each), Hexamite. HX40STRC (18mm Dia) or HX40STRE (26mm Dia - 3/4" BPT), Hexamite. UTEC4014 (14mm Dia) or UTEC4016 (16mm Dia) or UTEC4018 (18mm Dia), Sencera Co. Ltd.
400EP125 (12.5mm Dia) or 400EP18A (18mm Dia), Prowave. The following ultrasonic sensors do not work. Excessive ring time that swamps out the received signal. The distance between the ultrasonic transducers will need to be increased from 250mm to ?? ?mm to compensate. Low output level (increasing distance will only make matters worse). AU-5550, T/R40-16B (16mm Dia), Jaycar (AU$4.95 each). T/R40-16B (16mm Dia), Audiowell Electronics (Guangzhou) Co.,Ltd. Use the combined use type (bi-directional) not the receiver and transmitter type. The use of open structure types will eventually fail due to the effects of the weather. The ultrasonic transducers need to have a short ringing time < 0.5ms at 5v. 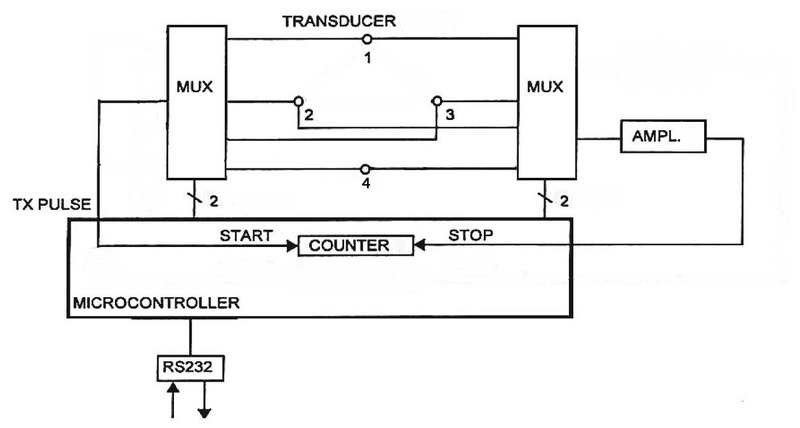 The ultrasonic transducers need to have a minimum detectable range of 0.2 m or less. 1. Draw a line segment with your ruler. 2. Put the point of your compass at one end of the segment and the pencil point at the other. 3. Without moving the point of the compass and without changing how wide it is set, swing the compass in approximately a quarter-circle (up & away from the line segment). 4. Without changing how wide the compass is spread, move the compass point to the other end of segment. 5. Swing the compass so that the arc you are creating crosses the arc you drew in step 3. 6. Mark the place where the two arcs cross. This is the apex of your triangle. 7. Using a ruler, draw line segments that connect the spot where the arcs cross to each end of the original line segment. Return to weather station page.